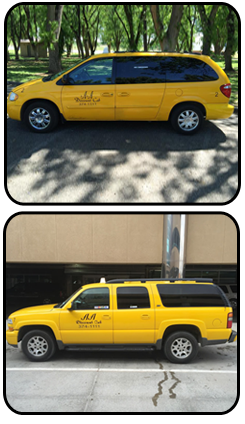 Trust AA Discount Taxi for efficient, affordable ambulatory and airport transportation. When you choose us, you're choosing a business that cares about your comfort and safety every step of the way. We appreciate how important it is to be on time, especially when it comes to your flight. Just give us a call for timely transportation to and from the Rick Husband Amarillo International Airport. With advance notice, we can even be there when your flight first arrives. Walk-up service is also available. We pick you up at the taxi lane near the lower-level baggage claim. Our drivers are happy to assist you with your luggage and go the extra mile by meeting you directly at the baggage area. We are based in Amarillo, Texas, but also provide transportation to any location outside of the area, including out of state. In fact, we've traveled as far as California. For your comfort and convenience, we have a variety of vehicle types to choose from, including a minivan, town car, and a Chevy Suburban™. Standard Rates Apply: $4.75 drop fee and $1.75 per mile. We work together with insurance companies and Workers' Compensation to provide ambulatory transportation to clients who are unable to drive for various reasons. Medical runs are available anytime and anywhere you need, including to doctors' offices, hospitals, and more. Please contact us for additional information.